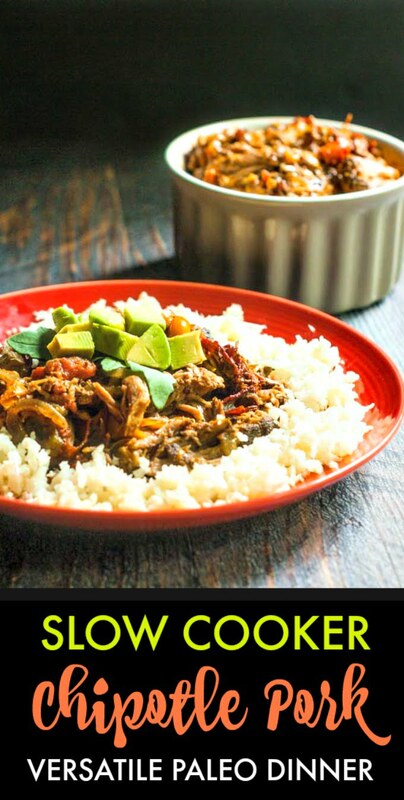 Easy Slow Cooker Chipotle Pork - a versatile Mexican dinner! 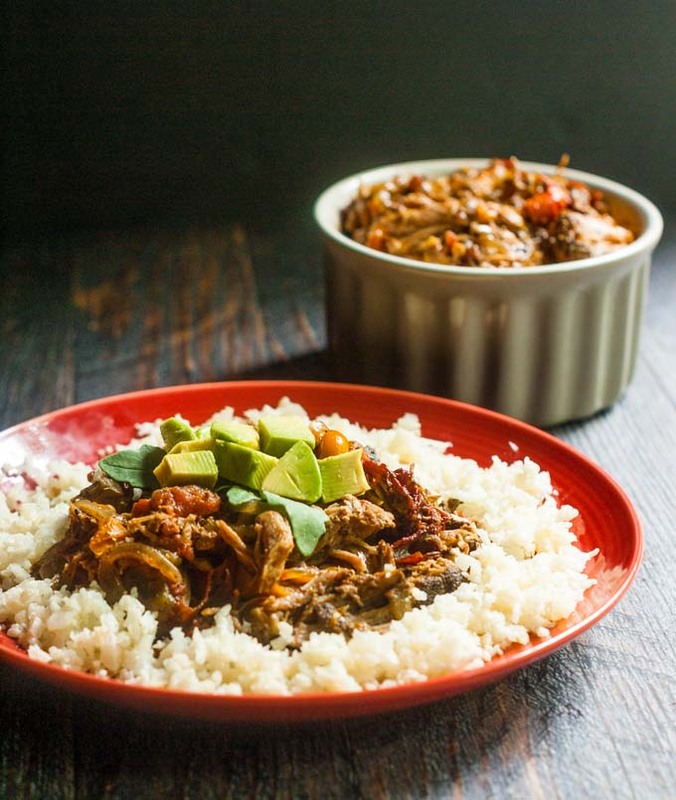 Easy Slow Cooker Chipotle Pork – a versatile Mexican dinner! 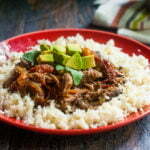 This slow cooker chipotle pork recipe is an easy dinner that can be eaten in a variety of ways. A versatile, easy and delicious meal! Low carb and Paleo too. 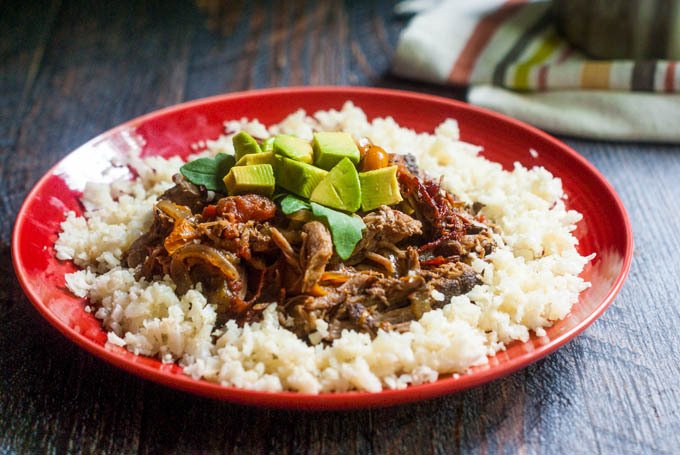 You might also like this spicy barbacoa beef in the Instant Pot. My family loves Mexican for dinner. While my husband is a little more adventurous with his food, my son is happy with just a tortilla, meat and cheese. So about once a week we seem to have some type of Tex-Mex meal that I usually make in a slow cooker. 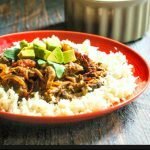 This week I scoured my pantry and freezer and came up with this slow cooker chipotle pork recipe. It was so yummy! My hubby and I ate it over cauliflower rice and my son ate it with tortillas and cheese (of course). Low carb for us and tacos for Max … win-win. The roast that I had in the freezer was rather mammoth in size. It was a 6 lb pork shoulder that was too much meat for us but I made the whole thing anyway. I froze half of the finished dish for another day and even had some leftovers. I love when I can do that! If you want to use a smaller roast, just scale the dry spices down. The spices are used to rub over the roast so if you have too much spice mix left after rubbing it on the meat, no big deal. The rest of the recipe you can keep the same measurements. So this is how my hubby and I ate it. I made some cauliflower rice and realized I didn’t have any cilantro so I used a bit of arugula. I love arugula so it was good to me and I ended up using a huge handful. You can eat this dish over rice or in tacos. You can eat just the meat if you wanted and add some cheese and sour cream. Or you can use it in a burrito or in a salad even. So you see it’s a very versatile and tasty dish. 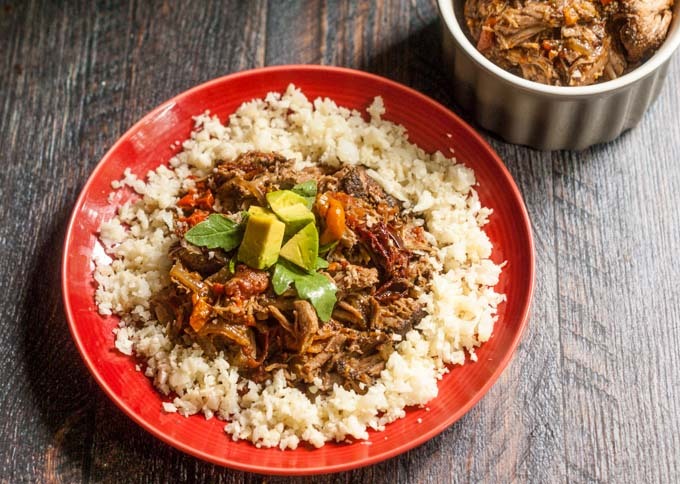 This slow cooker chipotle pork recipe is an easy dinner that can be eaten in a variety of ways. A versatile, easy and delicious meal! Low carb, Paleo and a great freezer meal. Cut slits in the pork roasts and stuff the slices of garlic in. Do this with all the garlic slices around the roast. Mix all the dry spices and rub liberally into the pork roast. Add the olive oil to a large pan and heat on medium high. Brown the roast on all sides. About 4 minutes on each side. Then set aside. Turn down the heat to medium and add the vinegar, tomatoes, chipotles and chiles to the pan and scrape up the brown bits from the roast. Cook for a few minutes while mixing everything together. To the slow cooker add your onion, peppers and chipotle mixture and stir well. Place the roast on top of the vegetables and cook for 6-8 hours. When down, shred your pork and mix well into the vegetables and sauce. Eat over rice or in tacos. Garnish with avocados, cilantro, sour cream, cheese or whatever you like. Holy YUM!? This seriously looks amazing. And there’s so much you can do with it, too! You’ve nailed it with this one, girl.